Trouble is brewing in Kumasi Asante Kotoko with the CEO, Major Yaw Larson (rtd), pitched in a destructive 'battle' against a section of the supporters and members of the former Sylvester Asare Owusu-led IMC. Even though the members of the IMC have indicated that the CEO had been making wild and unfounded allegations against them, which tended to question their integrity, they told a news conference that they did not believe that constituted a rift that could shake the very fabric of the club. Major Larson had persistently stated that there had been subtle attempts by his detractors to derail the strides being made by his administration.He is alleged to have mentioned how some people went to Dahomey to use juju to bring him down. Even though he did not mention names, this allegation received sharp reaction from the IMC members when they held a news conference at the Lavikus Hotel in Kumasi yesterday to react to allegations that they were bent on bringing the CEO's administration down. Recently, Major Larson lamented how the former IMC chairman had failed to return a club ambulance and some computers in his possession. At the weekend, Major Larson was on Luv FM in Kumasi to state that he had sensed an attempt by his detractors to use the Ashanti Regional supporters union, the Circles, to stage a demonstration against him by using the national Circles chairman, Mr Osei Boateng, as a decoy. He said the supporters' claim that they were demonstrating against Mr Osei Boateng was not true, explaining the reality was that the demonstration was to be staged against him (CEO).The demonstration was called off when the Police sensing danger, refused to give the supporters permit in line with the Public Order Act. But the supporters issued a strongly-worded statement to register their displeasure with the attitude of Major Larson in the handling of affairs in Kotoko. The six-point statement asked Major Larson to substantiate or retract allegations that some Kotoko elements went to Dahomey to use juju against him. It also called on the CEO to retract or substantiate the allegation that Kotoko players were being paid losing bonuses.Again the statement demanded from the CEO the basis for his allegation that some supporters were given monies to attack the Board members. 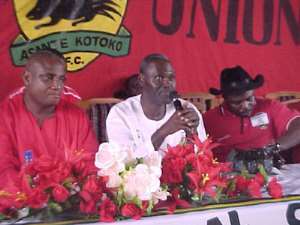 The IMC members said at their news conference that they needed to clear the air for everybody to see that they had nothing against Major Larson.Mr Asare Owusu, who was the principal speaker at the occasion, refuted the allegation by Major Larson that he kept the ambulance and computers because Kotoko owed him (CEO). He explained that when they were handing over to the Board at a time the new CEO had not been appointed, it was agreed that he kept the ambulance and computers until such a time that the club got a proper place to keep them. Mr Asare-Owusu pointed out that even though they do not have anything against the CEO, they would not hesitate to counter any attempts to discredit their hard won reputation. He also denied the allegation that they were instigating the supporters to demonstrate against Major Larson explaining any such act would mean they (former IMC members) do not love Kotoko. The former IMC member in-charge of Finance and Administration, Mr George Ayisi-Boateng, said the IMC purchased as many as 14 new players including the mercurial Charles Taylor and all involved money. He said they wanted to remove that unenviable tradition in Kotoko where every new administration attempt to condemn the predecessor.Mr Yaw Boafo, who was the IMC Secretary, called on Major Larson to feel free to contact the IMC members for advise when the need arises.